Find your new home base at Azure Apartments. Our one, two, and three bedroom apartments for rent were designed to enhance your busy life in Corpus Christi, Texas. Contemporary floor plans are highlighted with fully equipped kitchens featuring stainless-steel appliances. Each of our apartments at Azure Apartments has high ceilings to make your new home more spacious than ever. Select apartments feature the added touch of modern wood-style flooring. Whether you’re just looking for a place to settle down with your pet, or you’re searching for a spot to share with a roommate or two, Azure Apartments has the perfect apartment for you. 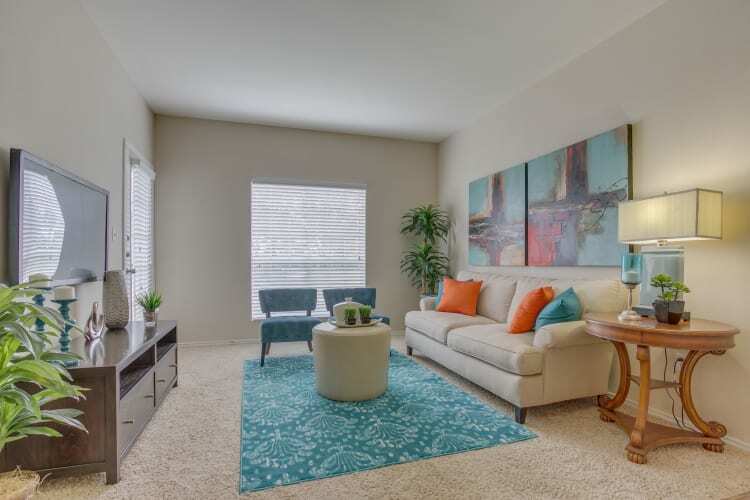 Our one, two, and three bedroom apartment homes were designed for your ultimate comfort and convenience in Corpus Christi. Each home includes spacious walk-in closets, so you’ll have plenty of room when you want to update your wardrobe. Select units at Azure Apartments even include an in-home washer and dryer so you can take care of laundry day from the comfort of your own home. Plus, your new space extends onto your own private balcony or patio – the perfect place to soak in the Texas sun with a cold drink in hand. Come see your favorite floor plan. Contact Azure Apartments today to schedule your personalized tour.